Since launching in 2002, OBaby has won many awards for its quality, style and reliability. Timeless designs and durable craftsmanship, the range offers exciting and innovative ideas that grow with your child and last for years to come. Planning your new little ones room can be one of the most exciting parts of expecting, so create a comfortable, welcoming nursery with our range of furniture from OBaby. Since launching in 2002, OBaby has developed a reputation for quality, style and reliability and are now one of the market leaders in the sector. 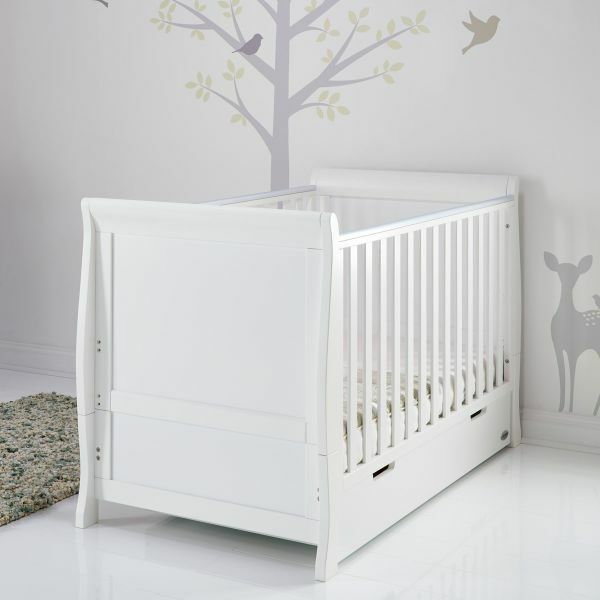 Combining timeless designs with durable craftsmanship, the range offers exciting and innovative ideas that add effortless style to any nursery and are cleverly constructed to grow with your child and last for years to come. 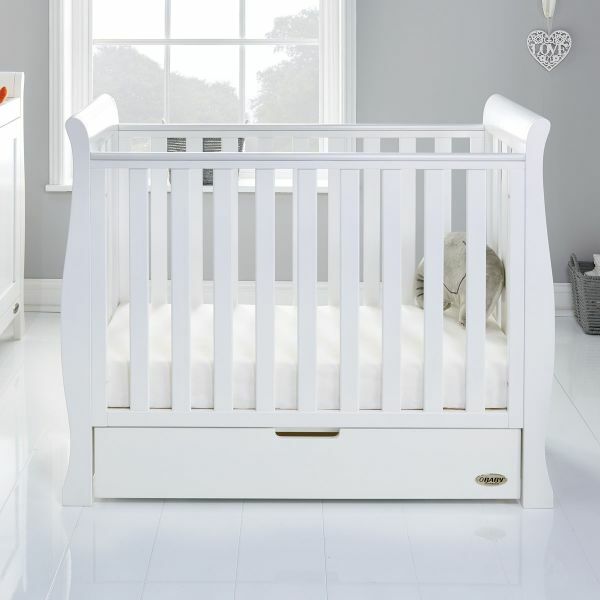 OBaby have created the Stamford range of sets of nursery furniture which all include the three essential pieces that you’ll need - a cot, wardrobe and changing station. Larger sets are available and they include a tall chest of drawers, toy box, glider chair and matching stool and a wall shelf. All the sets include plenty of practical storage and are well designed to ensure perfect comfort for you and your baby. Space is a big consideration when planning a nursery and the three cots in the Stamford room sets are designed to work with any size space. OBaby understand that the cot is a major investment and each one is designed to grow with your child. The cots transformed into either a toddler bed, junior bed or stylish daybed depending on which you choose and each design includes a handy storage drawer which slips underneath. The changing station is another nursery essential and the freestanding Stamford design incorporates drawer and cupboard space and has a recessed top to accommodate a changing mat. 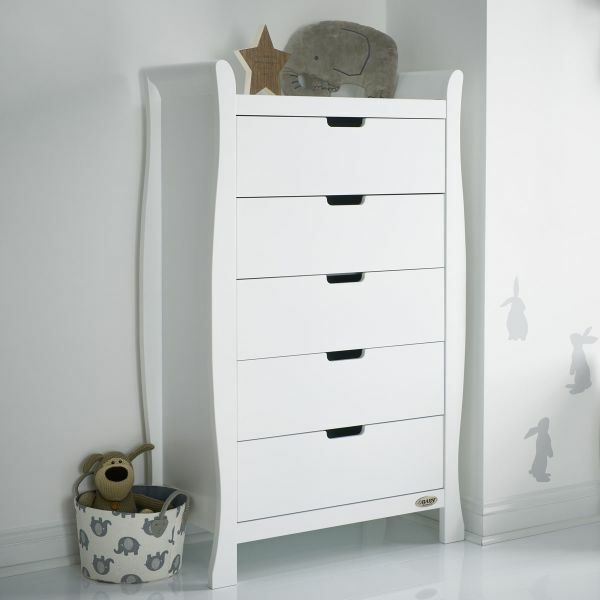 The design is classic and can be useful bedroom storage once you’re past the nappy stage. You may have noticed, that the tiniest people have the most stuff! Toys, nappies and clothes all need a home. The Stamford wardrobe includes clothes rails, drawers and adjustable shelves and is designed to fit your needs today and tomorrow. The toybox in the collection has been cleverly designed with a pull out drawer rather than a hinged lid to keep tiny fingers safe. 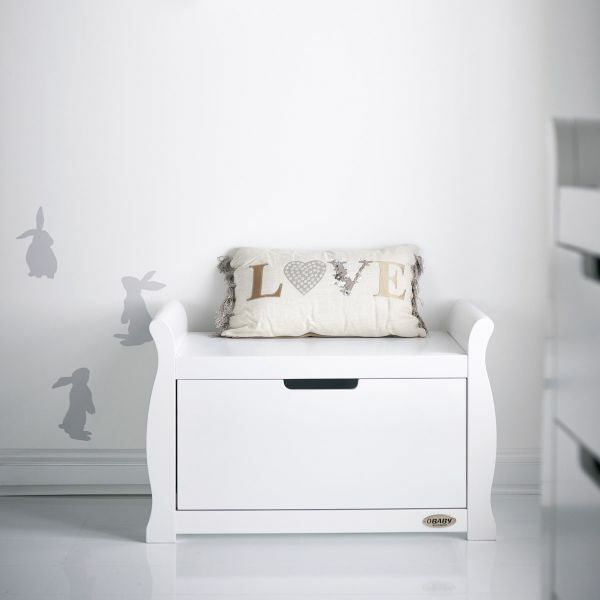 If space allows the gliding chair and stool are an ideal addition to a nursery. You’ll sit here to rock your baby to sleep, feed them, read a story, laugh, cuddle them, maybe even share a good cry at 4am! In short, it’ll be a place of a lot of parent-baby bonding so comfort is key. The Stamford gliding chair gentle rocks and is matched by the action of the coordinating stool and by simply lifting the arm ends, the backrest angle can be adjusted for your perfect position. Covered with a hard wearing microfibre, the padded back and seat cushions ensure maximum comfort and the arm rests feature a handy storage pocket too. The Stamford wall shelf are a nursery’s final finishing touch. Consider placing it near your changing unit for supplies that need to stay out of baby’s reach like lotions and nappies. Add baskets to the shelf to separate and organise supplies. The collection is characterised by the elegant scroll design and has neat finishing touches such as recessed handles and soft close drawers and doors. 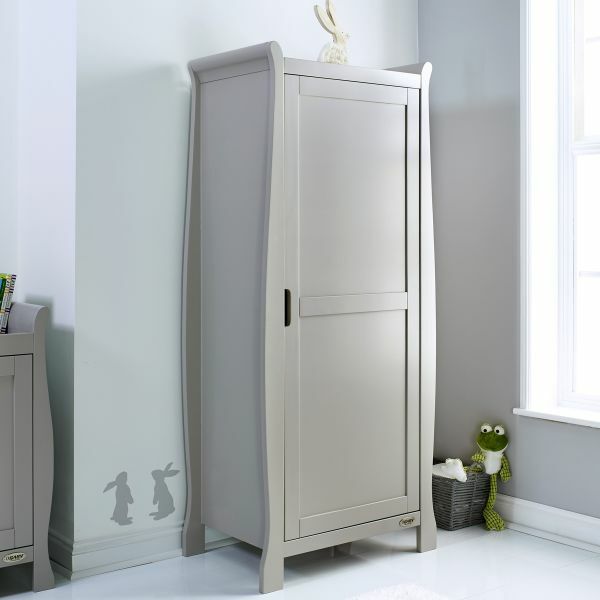 The item in the Stamford range is crafted from solid New Zealand pine and is available in three colourways - white, warm grey and taupe grey, designed to compliment any colour of nursery. All of the furniture is rigorously tested to meet the highest safety standards and each cot complies with BSEN 716 and BS 8509. Each item in the range comes with a five year guarantee when you register your purchase within 28 days.